The ABC affiliate in Wilmington, North Carolina recently did a piece on the 30-and-over crowd engaging in social networking. 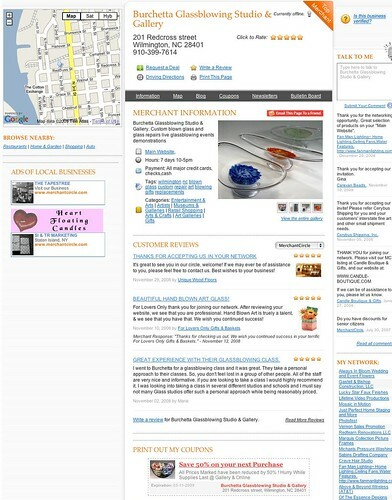 One of our merchants, John Burchetta of Burchetta Glassblowing Studio & Gallery, was featured in the news story talking about how he uses social networks, including MerchantCircle, to help promote his business. "It's such an integral part of our business now that if it was just removed, it would feel like I lost an appendage," says John. You can see the video of the story by clicking here and read the story by clicking here. In a previous MerchantCircle blog post, we spoke about our Rapleaf study, that showed we were introducing the concept of "social networking" to almost 2/3 of our merchants. At the time, 86% of our 650,000 merchants were over the age of 26, while 54% were over the age of 36. Social networking, is most definitely, not just for the high school and college crowds anymore.